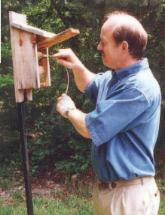 An easy to assemble nest box for all of your small birds. Pre-drilled holes make assembly quick and easy. A great parent & child project that wil last for years. See and hear everything in the nest even at night! Our lifetime house is made of recycled milk jugs and plastic. A great way to help your bluebird in two ways; provide them a nest and protect the enviroment. Now you can protect your nest box entrance from chewing squirrels and from woodpeckers! The Nuthatch entrance is also recommended for Titmice and Carolina Wrens. All portals are individally packed and come with 4 screws. 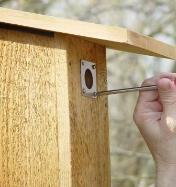 The 2 x 2 outside demensions allow you to protect slightly damaged and enlarged entrance holes on your nest boxes. Western Cedar Bluebird Nesting Box. Side opening. Easy to clean and monitor. Extra roof overhang helps protect the birds from the elements and predators. Stop Snakes and Raccoons from robbing your nest boxes. No sharp edges once assembled. Proven design with years of testing. Baffle comes complete with mounting hardware. Sturdy metal tube 8 inch diameter x 23 inch height. A Birds-I-View Exclusive! A Nest box designed to last a lifetime. Extra protection for your Bluebirds! Designed by BIV with all the added features: Long lasting "Trex" roof with extra overhang front and sides, Metal Portal to protect the entrance from woodpeckers and squirrels, Extra thick front and back for longer life, cross ventilation to keep the inside cooler and drainage in all corners. Easy open door folds down so it is out of your way when checking the nest or cleaning the box. Sparrow Spooker designs abound...Steve has taken one of the best ones and made some very helpful improvements to make it easier to use effectively. Not to be used year-round, there are some very specific directions for using �sparrow spookers� on nest boxes successfully. We include those instructions with our Sparrow Spooker kit. Especially important is the practice of not installing this device on a nest box until the native bird has laid at least one egg. FYI: Of Course, the purpose of this device is to discourage House Sparrows from nest boxes already occupied by native birds; it has nothing to do with our native sparrows that come to our yards and feeders. These species are not cavity �nesting birds so would likely not even be interested in the nest box.